This week our sponsor is - FRESH SQUEEZED STAMPS and our WINNER will receive TWO stamps sets of their choice!!! 1. Each Tuesday at 5am (PST), we will bring a new sketch to you, created by one of our design team members. This week's sketch is by Amy! 2. 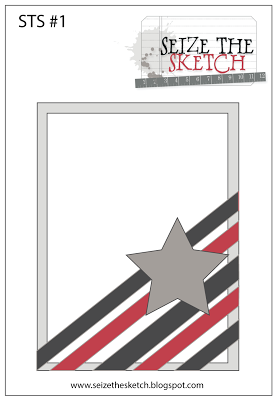 The sketches may be used to create any type of card! The sky is the limit! 3. At the end of the week, the "sketcher" will choose the weekly winner and the rest of the team will choose one honorable mention each! Here's my take - let's see yours! Cardstock and vine die from PTI, stamps from Hero Arts. Love your adorable take on the sketch, Cathy!!! Adorable card, those little guys are so cute. okay, now how fun is this?! The monkeys are just too cute. 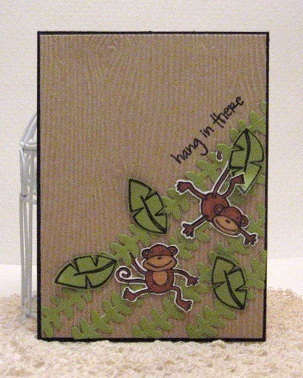 Creative & adorable use of the sketch--great card!